"I agree with Kim Jong Un of North Korea that our personal relationship remains very good, perhaps the term excellent would be even more accurate, and that a third Summit would be good in that we fully understand where we each stand. North Korea has tremendous potential for extraordinary growth, economic success and riches under the leadership of Chairman Kim. I look forward to the day, which could be soon, when Nuclear Weapons and Sanctions can be removed, and then watching North Korea become one of the most successful nations of the World!" 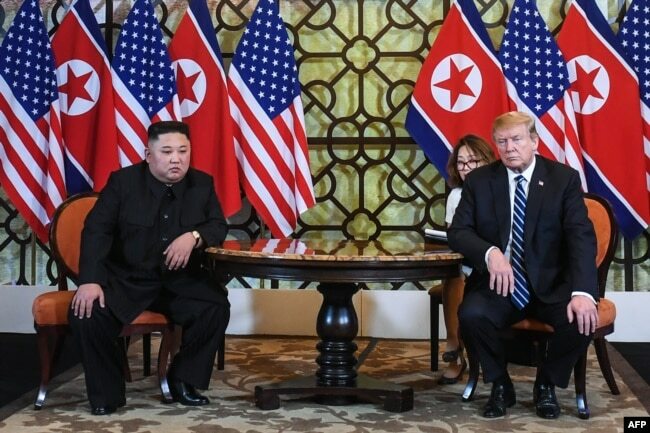 U.S. President Donald Trump and North Korea's leader Kim Jong Un meet during the second U.S.-North Korea summit at the Sofitel Legend Metropole hotel in Hanoi, Feb. 28, 2019.